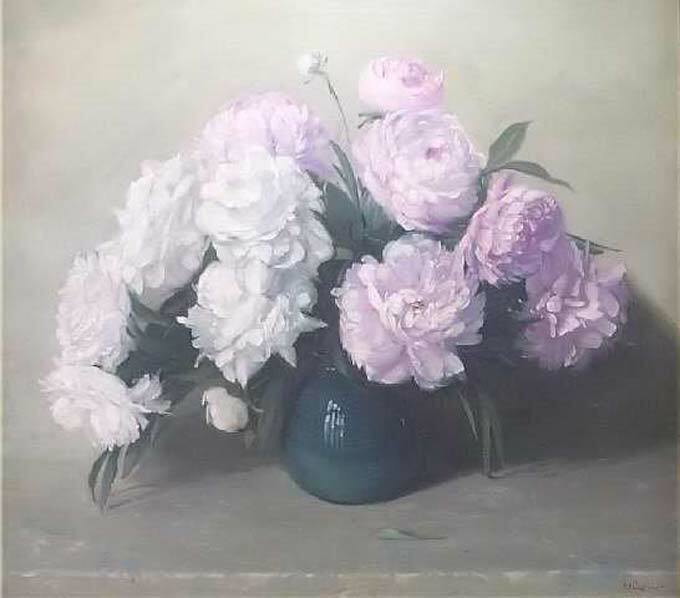 The Peonies | Kappa Kappa Kappa, Inc.
“The Peonies” by Varaldo J. Carianai measures 32”x36” and is a still life with peonies arranged in an aqua vase. This was the twelfth selected painting to be restored which was painted in 1932 and purchased in 1933 for $300 and currently valued at $9500. This is oil on canvas. Varaldo Cariana was born in the little town of Renazzo, Italy, near Bologna, but came to the United States at the age of three. After graduation from high school in Springfield, Mass., he became a student at the National Academy of Design in New York City, and later at the Art Students League. Then came the war and Mr. Cariani was in the thick of it all. When he came back to the United States, the soldier-artist could not paint for awhile, but a fellowship from the Tiffany Foundation sent him again on the quest of beauty. In 1920 he went on a visit to Nashville intending to stay two weeks. He remained living in Brown County and considered himself a native. He was very active in the Brown County Art Guild Galleries where Tri Kappa’s collection was housed. He was a genial host both at the Galleries and in his studio-home, an excellent cook, and a “happy mood” artist!